Trekking at Mt.Kushigata (櫛形山トレッキング) offers a beautiful walking under the breathtaking forest. Mt. Kushigata is 2,052m tall and it will take about 5 hours for round trip. At the forest, there are over 300 years old Japanese Larch, Fir and Tsuga diversifolia. Also, mountain flowers are so beautiful here. There is a new hiking trail that is very easy to walk for the beginners. It will takes about 5 hours for round trip. Route 140 to 413 west to Mt. Kushigata. Entitled: the 200 best Japanese mountain. Level: Intermediate people, Kids friendly. Mt.Kushigata is one of the 200 best Japanese mountain located in Yamanashi. It is 2,052m tall mountain that has a beautiful forest on the top of the mountain. 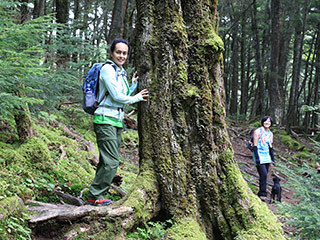 Therefore, you can enjoy beautiful hiking under the peaceful forest, especially the giant old trees are so mysterious. There are many points where you can enjoy mountain flowers. There are some view points that have great views of Mt. Fuji and Mt. Kitadake that are the highest and 2nd highest mountain in Japan. There are many hiking trails for the intermediate persons. Start at Ikenochaya Tozando Parking. Mt. Kitadake Observatory - 10 min. Momiji Valley - 40 min. Ayame Daira Flower point - 90 min. There is restroom. the top of Mt. Kushigata - 120 min. Back to parking - 60 min.